A Self-Organizing Feature Map (SOM) is a type of artificial neural network that is trained using unsupervised learning to produce a two-dimensional discretized representation of the input space of the training samples, called a map. 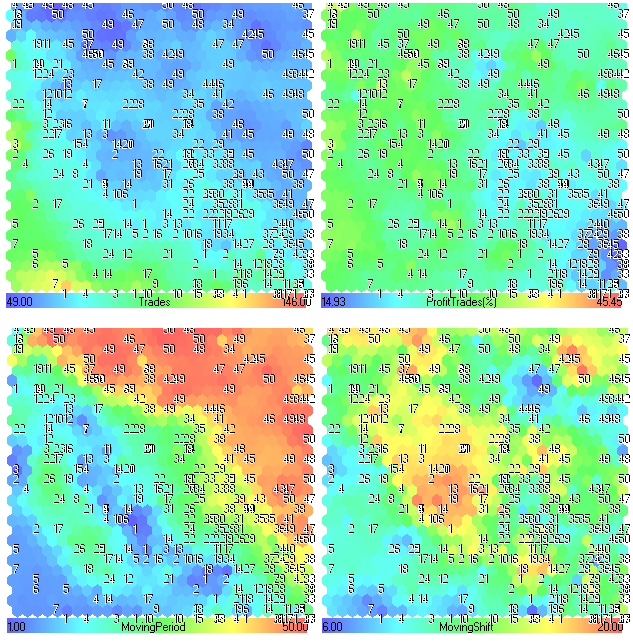 These maps are useful for classification and visualizing low-dimensional views of high-dimensional data, akin to multidimensional scaling. The model was first described as an artificial neural network by the Finnish professor Teuvo Kohonen, and is sometimes called a Kohonen Map. There are many algorithms available, we will follow the code, presented at http://www.ai-junkie.com. To visualize the data in MetaTrader 5 client terminal we will use the cIntBMP - a library for creation of BMP images. In this article we will consider several simple applications of Kohonen Maps. The Self-Organizing Feature Maps were first described by Teuvo Kohonen in 1982. In contrast to many neural networks, it doesn't need one-to-one correspondence between the input and target output data. This neural network is trained using unsupervised learning. The SOM may be described formally as a nonlinear, ordered, smooth mapping of high-dimensional input data onto the elements of a regular, low-dimensional array. In its basic form it produces a similarity graph of input data. The SOM converts the nonlinear statistical relationships between high-dimensional data into simple geometric relationship of their image points on a regular two-dimensional grid of nodes. 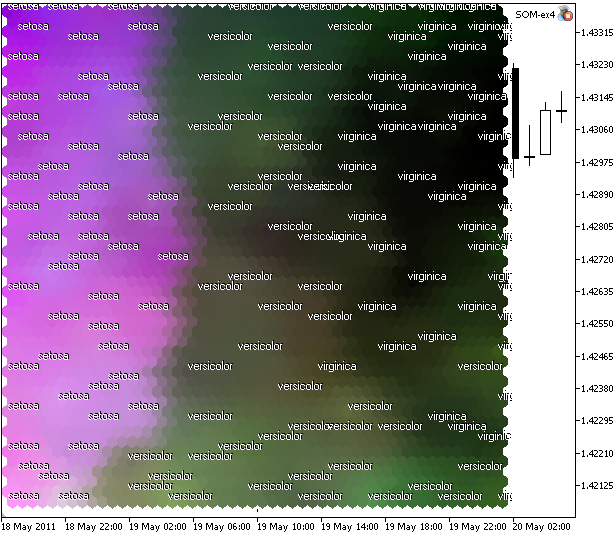 The SOM maps can be used for classification and visualizing of high-dimensional data. The simple Kohonen map as grid of 16 nodes (4x4 each of them is connected with 3-dimensional input vector) is presented in Fig. 1. Each node has (x,y) coordinates in lattice and vector of weights with components, defined in basis of the input vector. Unlike many other types of neural nets, the SOM doesn't need a target output to be specified. Instead, where the node weights match the input vector, that area of the lattice is selectively optimized to more closely resemble the data for the class the input vector is a member of. From an initial distribution of random weights, and over many iterations, the SOM eventually settles into a map of stable zones. Each zone is effectively a feature classifier, so you can think of the graphical output as a type of feature map of the input space. Each node's weights are initialized with random values. A vector is chosen randomly from the set of training data. Every node is examined to calculate which one's weights are most like the input vector. The winning node is commonly known as the Best Matching Unit (BMU). The radius of the neighbourhood of the BMU is calculated. Initially, this value is set to the radius of the lattice, but dimishless each time step. For any nodes found inside the radius of BMU, the node's weights are adjusted to make them more like the input vector. The closer a node to the BMU, the more its weights get alerted. The details can be found at http://www.ai-junkie.com. The classic example of Kohonen map is a color clustering problem. Suppose we have a set of 8 colors, each of them is represented as a three dimensional vector in RGB color model. When working with Kohonen maps in MQL5 language, we will follow the object-oriented paradigm. We need two classes: CSOMNode class for a node of the regular grid and CSOM which is a neural network class. The implementation of class methods can be found in som_ex1.mq5. The code has a lot comments, we will focus on the idea. The result is presented in Fig. 2. One can see from the Fig. 3, the Kohonen Map is formed after 2400 steps. If you read the Visual Explorations in Finance: with Self-Organizing Maps book, written by Guido Deboeck and Teuvo Kohonen, you remember that lattice nodes also can be represented as hexagonal cells. By modifying the code of the Expert Advisor, we can implement another visualization. In first example we have used 8 colors in training set with specified the color components. We can extend the training set and simplify the specifying of color components by adding two methods to CSOM class. Note that in this case Kohonen Maps are simple because there are just few colors, separated in the color space. As a result, we have got the localized clusters. The problem appears if we consider more colors with closer color components. 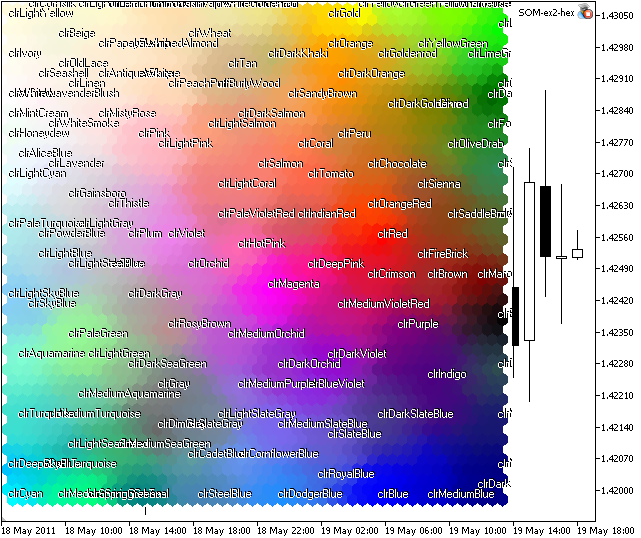 In MQL5 Language the Web-colors are predefined constants. What if we apply the Kohonen algorithm to a set of vectors with similar components? As you see, to simplify the work with colors, we have added two new methods, the explicit specifying of color components isn't needed now. If we launch the som-ex2-hex.mq5, we will get the picture, presented in Fig. 8. As you see, there are some clusters, but some colors (like xxxBlue) are located in different regions. The reason of this fact is the structure of training set, there are many vectors with close components. Next we will consider a simple example that will attempt to group twenty-five foods into regions of similarity, based on three parameters, which are protein, carbohydrate and fat. Table 1. Protein, carbohydrate and fat for 25 foods. This problem is interesting, because input vectors have different values and each components has its own range of values. It's important for visualization, because we use the RGB color model with components vary from 0 to 255. Fortunately, in this case the input vectors are also 3-dimensional and we can use the RGB color model for Kohonen map visualization. As you see, we have added m_max_values and m_min_values arrays for storage of maximal and minimal values of training set. For visualization in RGB-color model, the "scaling" is needed, so we have overloaded the Train(), Render() and ShowPattern() methods. The search of the maximal and minimal values is implemented in Train() method. The result of som_ex3.mq5 is presented in Fig. 9. Component analysis. One can see from the map, that Sugar, Rice and Cornflakes are plotted with green color because of the Carbohydrate (2nd component). The Butter is in green zone, it has a lot of Fat (3rd component). A lot of Protein (1st component, red) is contained in Beef Steak, Roast Chicken and Tuna Steak. You can extend the training set by adding new food from the Food Composition Tables (alternative table). As you see, the problem is solved for "pure" R,G,B directions. What about other foods with several equal (or mostly equal) components? Futher we will consider the Component Planes, it's very useful, especially for cases when input vectors have dimension, greater than 3. For three-dimensional vectors, there is no problem with visualization. 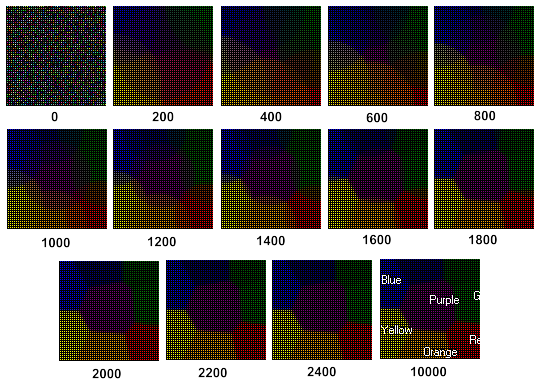 The results are clear because of RGB-color model, used to visualize color components. 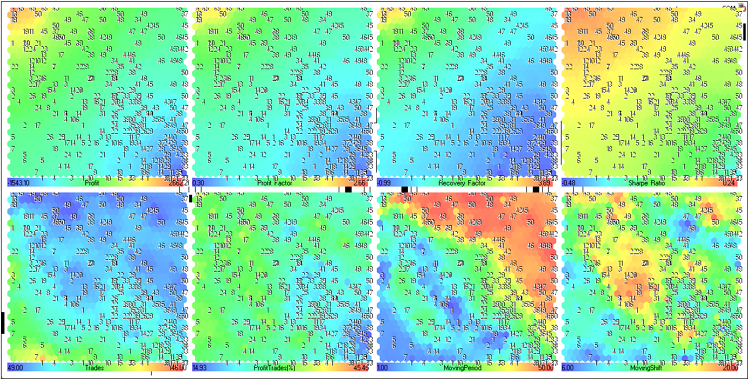 When working with high-dimensional data, we need to find the way to visualize them. The simple solution is to plot a gradient map (for example, Black/White), with colors, proportional to the vector length. The other way is to use another color spaces. In this example we will consider the CMYK color model for Fisher's Iris data set. There is a better solution, futher we will consider it. The Iris flower data set or Fisher's Iris data set is a multivariate data set introduced by R. Fisher (1936) as an example of discriminant analysis. The dataset consists of 50 samples from each of three species of Iris flowers (Iris setosa, Iris virginica and Iris versicolor). Four features were measured from each sample, they are the length and the width of sepal and petal, in centimeters. The Iris flower data set can be found in SOM_ex4.mq5. In this example we will use the intermediate CMYK-color space for plotting, i.e. we will consider the weights of the node as a vectors in CMYK space. To visualize the results, the CMYK->RGB conversion is used. A new method int CSOM::CMYK2Col(uchar c,uchar m,uchar y,uchar k) is added to CSOM class, it used in CSOM::Render() method. Also we have to modify the classes to support 4-dimensional vectors. The result is presented in Fig. 11. What do we see? We haven't got the complete clustering (because of the problem's features), but one can see the linear separation of iris setosa. The reason of this linear separation of setosa is a large "Magenta" component (2nd) in CMYK space. 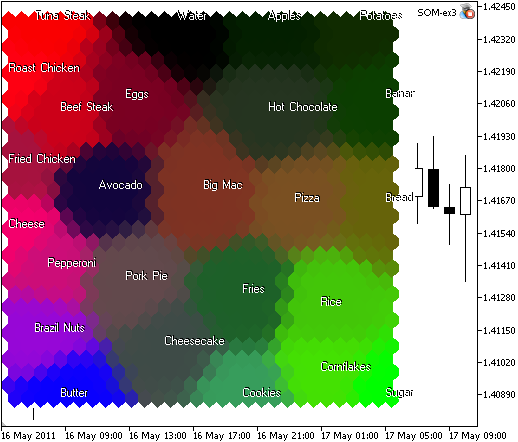 One can see from the previous examples (food and iris data clustering) there is a problem with data visualization. For example, for food problem, we analyzed the Kohonen Map using the information on certain colors (red, green, blue). In addition to basic clusters, there were some foods with several components. Moreover, the analysis became difficult if the components are mostly equal. The component planes provide the possibility to see the relative intensity for each of the food. 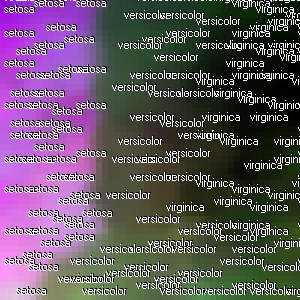 We added the Palette array, the GetPalColor() and Blend() methods. The drawing of a node is placed to RenderCell() method. The results of som-ex4-cpr.mq5 is presented in Fig. 13. In this case we use the grid with 30x30 nodes, image size 300x300. 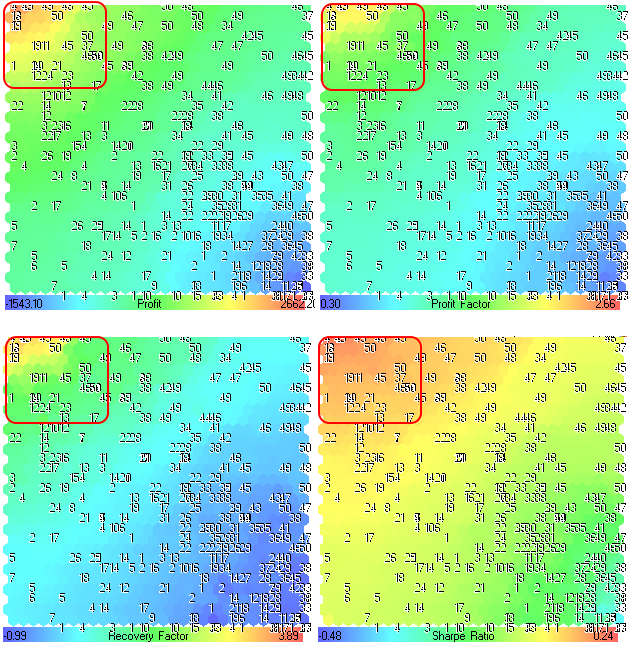 The component planes plays an important role in correlation detection: by comparing these planes even partiallly correlating variables may be detected by visual inspection. This is easier if the component planes are reorganized so that the correlated ones are near each other. In this way, it's easy to select interesting component combinations for further investigation. Let's consider the component planes (Fig. 14). The values of maximal and minimal components are shown in the gradient table. 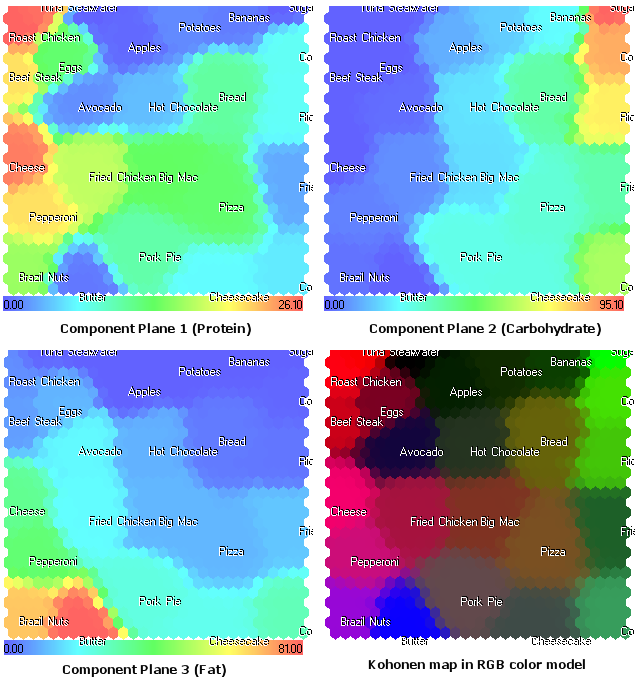 All these component planes, represented in the CMYK-color model are shown in Fig. 15. Let's remind the setosa iris type. 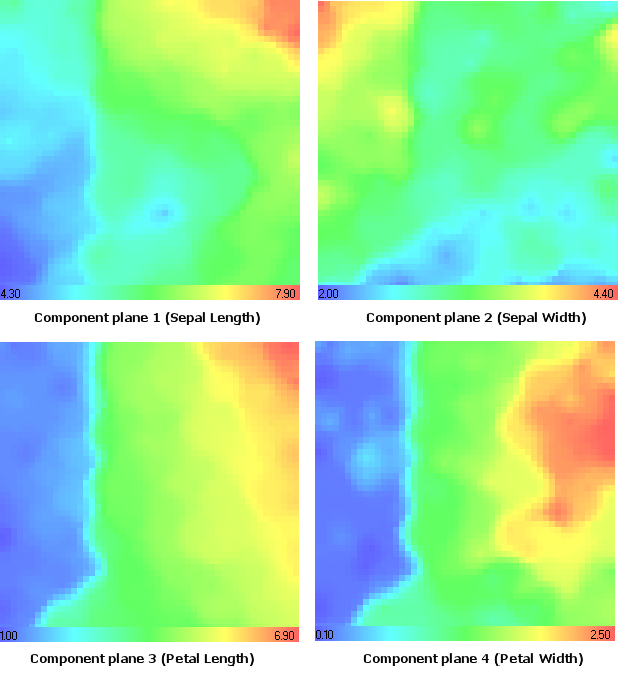 Using the component plane analysis (Fig. 14) one can see that it has minimal values in 1st (Sepal Length), 3rd (Petal Length) and 4th (Petal Width) component planes. It's remarkable that it has maximal values in the 2nd component plane (Sepal Width), the same result we have got in CMYK-color model (Magenta component, Fig. 15). Now let's consider food clustering problem using the component plane analysis (som-ex3-cpr.mq5). The result is presented in Fig. 16 (30x30 nodes, image size 300x300, hexagonal cells without borders). We added the showing of titles option in ShowPattern() method of CSOM class (input parameter ShowTitles=true). The component plane representation, shown in Fig. 17 opens a new view on the structure of food components. Moreover, it provides additional information, that cannot be seen in RGB color model, presented in Fig. 9. For example, now we see the Cheese in the 1st component plane (protein). In RGB color model it shown with color, close to magenta, because of the fat (2nd component). The examples we have considered have some specific features, the dimension was fixed and visualization algorithm was different for different representations (RGB and CMYK color models). Now we can generalize the algorithm for arbitrary dimensions, but in this case we will visualize the component planes only. The program must be able to load the arbitrary data from CSV file. The first line of the file contrain the names (titles) of the input data vector. The titles are needed to distingush the component planes, we will print their names in the gradient panel. The name of the pattern is located in the last column, in our case it's the name of the food. The name of the file with training patterns is specified in DataFileName input parameter, in our case "food.csv". The result is shown in Fig. 18. Also we added the ColorScheme input parameter for gradient scheme selection. At present time there are 4 color schemes available (ColorScheme=0,1,2,4=Black-White, DarkBlue-Blue-Green-Yellow-Red, Red-Black-Green, Red-White-Green). You can easy add your own scheme by adding the gradient into the CSOM::InitParameters() method. The result is shown in Fig. 19. Now we have a tool for the real applications. 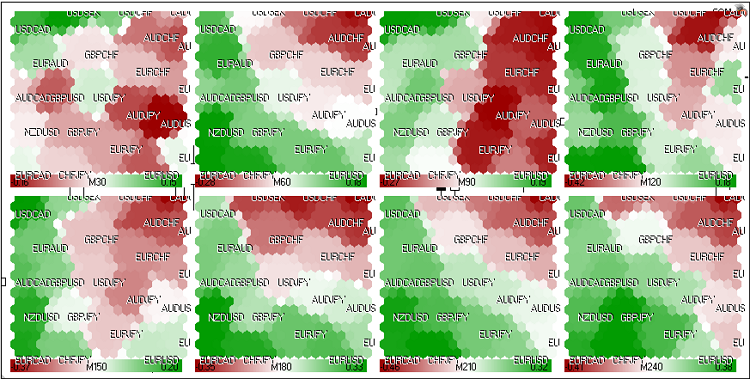 Self-Organizing Feature Maps can be used for the market movement maps. 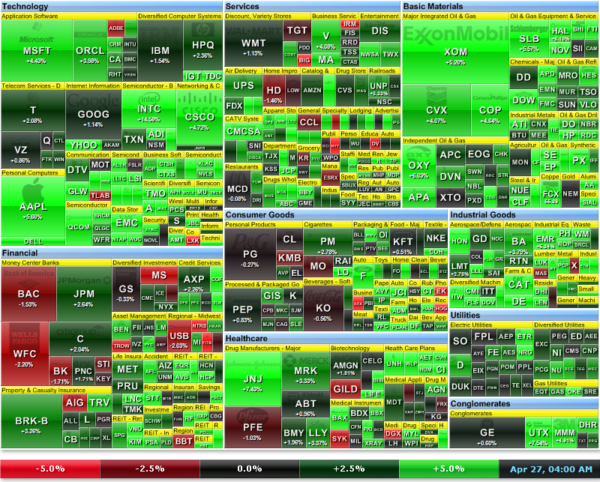 Sometimes the global picture of the market is needed, the market heat map is a very useful tool. The stocks are combined together depending on economic sectors. The size of the stock rectangle depends on market capitalization. The same analysis can be done in MetaTrader 5 client terminal using the Kohonen Maps. The idea is to use the growth rates (in %) for several timeframes. We have the tool for working with Kohonen maps, so the only needed is the script, that saves the data to .csv file. The price data on CFD prices of American stocks (#AA, #AIG, #AXP, #BA, #BAC, #C, #CAT, #CVX, #DD, #DIS, #EK, #GE, #HD, #HON, #HPQ, #IBM, #INTC, #IP, #JNJ, #JPM, #KFT, #KO, #MCD, #MMM, #MO, #MRK, #MSFT, #PFE, #PG, #T, #TRV, #UTX, #VZ, #WMT и #XOM) can be found at MetaQuotes Demo server. The historical data must be downloaded, you can do it automatically using the DownloadHistory script. After launching the som.mq5(ColorScheme=3, CellsX=30,CellsY=30, ImageXSize=200, ImageXSize=200, DataFileName="dj.csv"), we will get 8 pictures, each of them corresponds to the time intervals of 30, 60, 90, 120, 150, 180, 210 and 240 minutes. 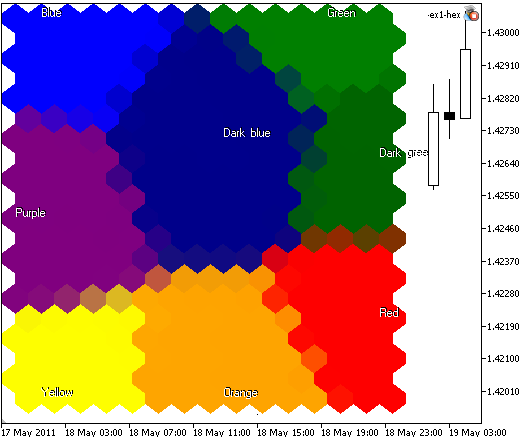 The Kohonen maps of the market growth rate data (American stocks) of 4 last hours of 23 may 2011 trade session are presented in Fig. 21. Figure 21. Kohonen maps for American stocks (last 4 hours of 23 may 2011 trade session). One can see from the Fig. 21, the dynamics of #C (Citigroup Inc.), #T (AT&T Inc.), #JPM (JPMorgan Chase & Co), #BAC (Bank of America) is similar. They grouped in a long-term red cluster. During last 1.5 hours (M30, M60, M90) its dynamics became green, but generally (M240) the stocks were in the red zone. Using Kohonen maps, we can visualize the relative dynamics of stocks, find leaders and loosers and their enviroment. The elements with similar data forms clusters. As we see from the Fig. 21a, the price of the Citigroup Inc stocks was the leader of falling. 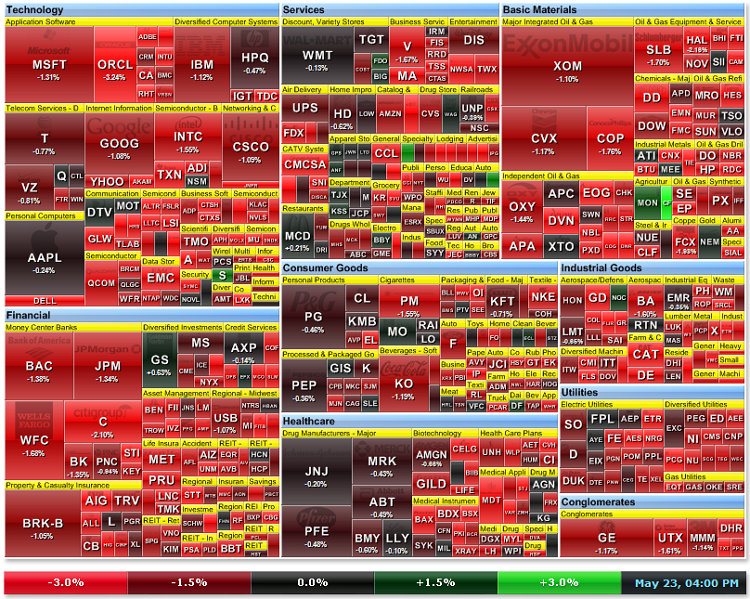 Generally, all the stocks of finance companies were in red zone. The following pairs are used: EURUSD, GBPUSD, USDCHF, USDJPY, USDCAD, AUDUSD, NZDUSD, USDSEK, AUDNZD, AUDCAD, AUDCHF, AUDJPY, CHFJPY, EURGBP, EURAUD, EURCHF, EURJPY, EURNZD, EURCAD, GBPCHF, GBPJPY, CADCHF. The growth rates are exported to fx.csv using the fx.mq5 script. In addition to prices, you can use the values of the indicators at different timeframes. 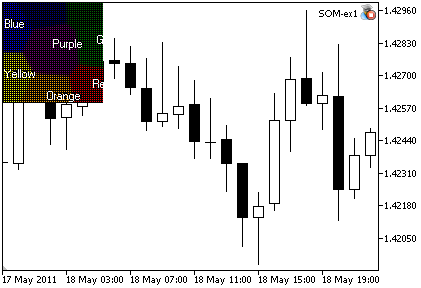 The Strategy Tester of MetaTrader 5 client terminal provides an opportunity to explore the structure of parameter space and find the best set of the strategy parameters. Also you can export the optimization results using the "Export to XML (MS Office Excel)" option from the context menu of "Optimization Results" tab. The use of tester statistics allows to help in analysis of parameter space. It's remarkable that many parameters of the statistic are closely related and depends on trade performance results. For example, the best trading results have the largest values of Profit, Profit Factor, Recovery Factor and Sharpe Ratio parameters. This fact allows to use them in analysis of the results. In this chapter we will consider the analysis of the optimization results of MovingAverage.mq5 Expert Advisor, included in standard package of MetaTrader 5 client terminal. This Expert Advisor is based on crossover of price and moving average indicator. It has two input parameters: MovingPeriod and MovingShift, i.e. we will have the XML-file with 43 columns as a result. Note, we have added the ProfitTrades (%) parameter (it's absent in the results), it means the percent of profitable deals and calculated as result of division of ProfitTrades (28) by Trades (22), multiplied by 100..
Let's prepare the optim.csv file with 9 columns for 400 sets of input parameters of MetaTrader 5 Strategy Tester. Note, that we have used the value of MovingPeriod as a Title column, it will be used to "mark" the patterns on the Kohonen maps. Let's consider the component planes of the upper row (Profit, Profit Factor, Recovery Factor и Sharpe Ratio). They are combined in Fig. 24. The first, that we needed is to find the regions with the best optimization results. One can see from the Fig. 24, the regions with maximal values are located in the upper left corner. The numbers correspond to the averaging period of Moving Average indicator (MovingPeriod parameter, we used it as a title). The numbers location is the same for all component planes. An each component plane has its own range of values, the values are printed in the gradient panel. The best optimization results have the larges values of Profit, Profit Factor, Recovery Factor and Sharpe Ratio, so we have information about the regions on the map (outlined in Fig. 24). The component planes for Trades, ProfitTrades(%), MovingPeriod and MovingShift are presented in Fig. 25. At first glance, there isn't any interesting information. The first 4 component planes (Profit, Profit Factor, Recovery Factor and Sharpe Ratio) looks similar, because they depends directly on performance of trade system. One can see from the Fig. 24, the upper left region is very interesting (for example, best results may be achieved if we set the MovingPeriod from 45 to 50). The Expert Advisor was tested at hourly timeframe of EURUSD, its strategy based on trend, we can consider these values as a "market trend" memory. If it's true, the market trend memory for the first half of 2011 is equal to 2 days. Let's consider other component planes. Looking in Fig. 26, we can see that lower values of MovingPeriod (blue regions) leads to the greater values of Trades (yellow-red regions). If the period of moving average is low, there are many crossovers (trades). 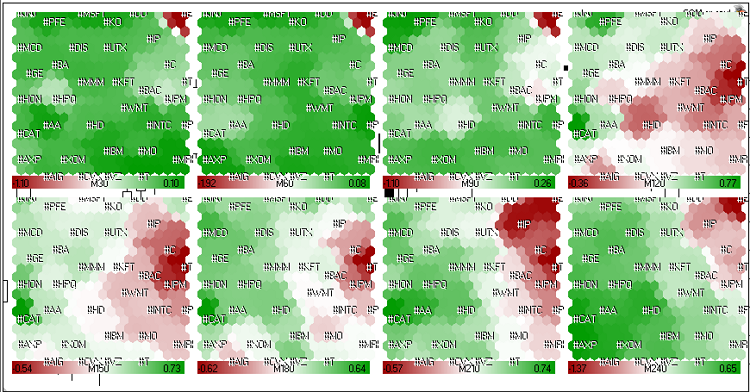 Also we can see this fact on the Trades component plane (green regions with numbers below 20). The number of trades decreases (blue regions) with increasing MovingShift (ytellow-red regions). Comparing the component planes for MovingShift and Fig.24, one can see that MovingShift parameter isn't very important for performance of this trade strategy. The percent of profitable trades ProfitTrades(%) doesn't depend directly on MovingPeriod or MovingShift, it's an integral characteristic of the trade system. In other words, the analysis of its correlation with input parameters has no meaning. More complex trade strategies can be analyzed the similar way. You need to find the most important parameter(s) of your trade system and use it as a title. The main advantage of Self-Organizing Feature Maps is the opportunity to produce a two-dimensional discretized representation of high-dimensional data. The data with similar characteristics form clusters, it simplifies the correlation analysis. The details and other applications can be found in excellent book Visual Explorations in Finance: with Self-Organizing Maps by Guido Deboeck and Teuvo Kohonen. After the publication of the Russian version, Alex Sergeev has proposed the impoved version of classes(SOM_Alex-Sergeev_en.zip). Added a method CSOM::HideChart - hides chart. Added class members m_chart, m_wnd, m_x0, m_y0 - (chart, window, and coordinates to show images). + added m_sID - object names prefix. The prefix uses file name, by default "SOM" prefix is used. All maps are saved to the folder with m_sID name. The bmp files are named by column name of the patterns. Modified the CSOM::ShowBMP method (maps saved in \Files folder insted of \Images, it works much faster). The CSOM::NetDeinit changed to CSOM::HideBMP. Modified the CSOM::ReadCSVData method, the first column contain titles. Added a flag to show intermediate maps in CSOM::Train(bool bShowProgress). The showing of intermediate maps in CSOM::Train is performed every 2 seconds (instead of iteration), the progress is shown on the chart using the Comment. Optimized names of some variables, class methods ordered by category. The drawing of bmp is a very slow process. If you don't really need it, don't draw it every time. The example of SOM images with optimization results are included in archive. I notice the pattern is practically defined after awhile but the iteration is fixed at 10000 so it still continues to run until 10000. Is it possible for the algorithm to detect and stop the iteration when the pattern is more or less defined? but if i open with MT4 editor, I can see the characters. Any idea how to fix it? Try this version (saved as Unicode). Does this article include everything to get a expert advisor? Im interested in implementing Neural Network Expert Advisor. In this article, we continue studying the principles of working with Internet using HTTP requests and exchange of information with server. It describes new functions of the CMqlNet class, methods of sending information from forms and sending of files using POST requests as well as authorization on websites under your login using Cookies. If an indicator uses values of many other indicators for its calculations, it consumes a lot of memory. The article describes several methods of decreasing the memory consumption when using auxiliary indicators. Saved memory allows increasing the number of simultaneously used currency pairs, indicators and strategies in the client terminal. It increases the reliability of trade portfolio. Such a simple care about technical resources of your computer can turn into money resources at your deposit. MQL5.community built-in services offer great opportunities both to MQL5 developers and ordinary traders with no programming skills. But, all these features cannot be implemented without an in-house secure payment system that provides a convenient basis for settlements between buyers and sellers. In this article, we will show how the MQL5.community payment system works. User interface of the MetaTrader 5 platform is translated into several languages. Don't worry if your native language is not among the supported ones. You can easily complete the translation using the special MetaTrader 5 MultiLanguage Pack utility, offered by MetaQuotes Software Corp. for free to all comers. In this article we will show some examples of how to add a new user interface languages to the MetaTrader 5 platform.